Right-Draw® is an easy-to-use data entry tool that simplifies the entire HVAC design process from load calculations and system design to duct and radiant designs and parts takeoff list. View overview video. Note: This module cannot be used alone. Features listed below are only applicable when used in combination with other modules. Additional information on Right-Draw® can be found within each individual product page. Right-Draw® replaces tedious line-by-line calculations and manual data entry, allowing data to be automatically entered by simply dragging and dropping HVAC Shapes™ from a toolbar onto the drawing screen. These smart objects store all of the property information of each shape, making it easy for you to complete your calculation and designs. With the Hotlink™ Technology, if an aspect of your design or load changes, all the affected components automatically adjust to the new conditions including designs, sizing, and parts take-off lists. Complete room-by-room load calculations and designs. Complete block load calculations in quickly and easily. Simply draw a box (or use the room wall-by-wall smart shape tool for complex shapes, add some windows and doors, and adjust your settings. Easily import PDF and AutoCAD files into Right-Draw® for calculations from pre-drawn plans. Throw away your scale ruler and simply upload your CAD or PDF file into Right-Draw®, then trace the footprint. Choose to insert, scale and rotate multiple PDF files in the same way as DWG and DXF files, and write layers of your design back to a CAD file, if needed. You can even write back your notes and designs for paperless communication with builders. Add an unlimited amount of floors and rooms. This includes unlimited zone capabilities with easy drag and drop zoning and color-coding. In Right-Draw®, each floor of your design is considered a “sheet”. Every sheet is its own layer within the program and can be locked or unlocked, visible or hidden, for ease of use. You may choose to print these sheets directly from the program, which each print out on individual pages. Tackle irregular rooms. Right-Draw® can handle any room plan, with special tools for vaulted ceilings, dormers, knee-walls, walk-out basements, non-rectangular shapes, and more. Right-Draw® links all of the other Right-Suite® Universal modules, making it fast and easy to complete load calculations, duct or radiant designs, and more. Thanks to our Hotlink Technology™, any changes you make will automatically update within the worksheet and every module you own- meaning no more data entry, no more mental gymnastics and no more wasted time. 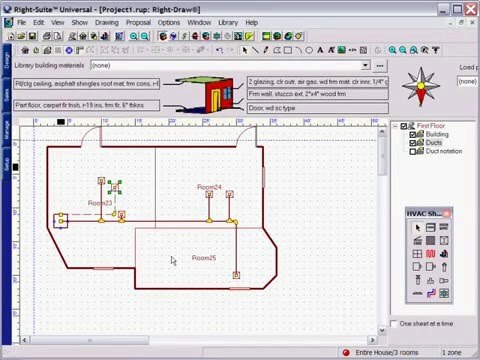 This video is an overview of Right-Suite Universals Data Entry Module, Right-Draw. With smart HVAC tools, you can draw out your load calculation and much more!